You can take just about any old pair of jeans and flannel shirt to create a homemade cowboy outfit. In fact, creating a cowboy outfit from clothes and items you already have around your house gives you a quick, cheap costume you can pull out anytime you’re headed to a costume party or to a themed party involving cowboys or the wild west. 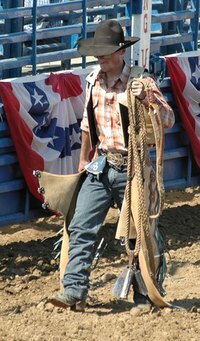 However, planning ahead a little and putting some preparation into your outfit will give it a little more authenticity and help your costume stand out from the crowd, especially if you don’t dress like a cowboy on a regular basis. Make your boots. If you already have a pair of cowboy boots, use those. However, if you don’t spend your days herding cattle on a ranch out west, you may have to make some. Use a pair of brown shoes and cut out brown construction paper to cover them. Use a black or dark brown crayon to draw a paisley design on the paper. Put on a pair of old, worn-out jeans. If you want to go for more of a rugged cowboy look, rub some dirt into the pants and shake them out. Tuck the pants into your boots to look like you’re trying to keep your jeans out of the mud. Put a large belt buckle on top of a leather belt. Cowboys are known for their large belt buckles, so this is one thing you don’t want to skip out on. The design of the belt buckle doesn’t matter much, as long as it’s there. If you don’t own a large belt buckle, you can cut one out of construction paper or a piece of brown felt. Put a toy gun and its holster on the side of your belt. The gun is optional but if you want to pull off a sheriff cowboy look, you’ll need to include it. Put on a long-sleeved, plaid flannel shirt. Button the shirt all the way up, but leave one or two buttons at the top undone. If it’s warm outside, you can roll the sleeves up to your elbows. Tie a handkerchief around your neck. The handkerchief should be a different color from your shirt so it that stands out but you don’t need to worry about matching or coordinating it with the rest of your outfit. Put a leather vest on over your plaid shirt. If you don’t have a leather or brown vest sitting around your house, don’t worry about it. The vest is an optional costume piece. Top off your outfit with a wide-brimmed cowboy hat. Draw on a mustache with face paint or a washable marker and put a toothpick or long piece of grass in your mouth to give your look the finishing touches.